Actually, the DIALEV shouldn't even exist! An object that steadily levitates in the air, without electronic regulation, wire, cord or batteries? That doesn't work. Or does it? The name "DIALEV" is derived from DIAmagnetic LEVitation. The DIALEV is a graphite disc that permanently levitates approx. 1 mm above four strong neodymium magnets. The magnets and graphite disc are packaged in a massive wooden box. The wooden box measures 50 x 50 x 36 mm. 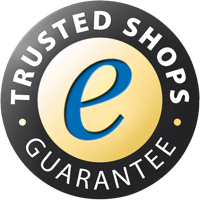 A metal disc is embedded in the top cover, which magnetically locks top and bottom. During transport, the disc is locked into position with a thin strip of magnetic sheet. Before you pack it away again, place the foil on top of the disc to prevent the brittle graphite from being damaged. The DIALEV will be delivered in a black gift box, a manual in six languages is enclosed. The video shows how the DIALEV is unpacked and the graphite disc levitates after the holding device has been removed. Amaze your favourite nerd or system administrator with it. Even if he or she already owns all the coolest gadgets - a DIALEV is probably not one of them. Or use it as an inventive and memorable customer gift. The magnets are four cube magnets W-12-N that are arranged and glued as shown. Diamagnetism is a physical phenomenon, which is rarely witnessed in everyday life, hence most people are not familiar with it. It describes the feature of certain materials of being repelled by a magnet. Many materials are slightly diamagnetic, but normally the repulsion is so light that it is barely visible in everyday life. 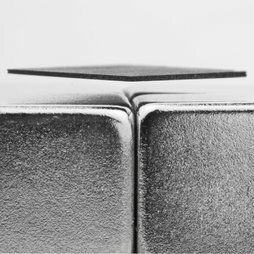 The diamagnetism in pyrolytic graphite, however, is very pronounced: The repulsion by the cube magnets is so strong that the disc levitates above them. The disc levitates about 1 mm above the magnets, which leaves enough room in the gap for 2 to 3 business cards. Since the magnetic field is not at all disrupted by paper, the disc continues to levitate. You can choose between 3 versions: beechwood, pinewood and black (varnished beechwood).